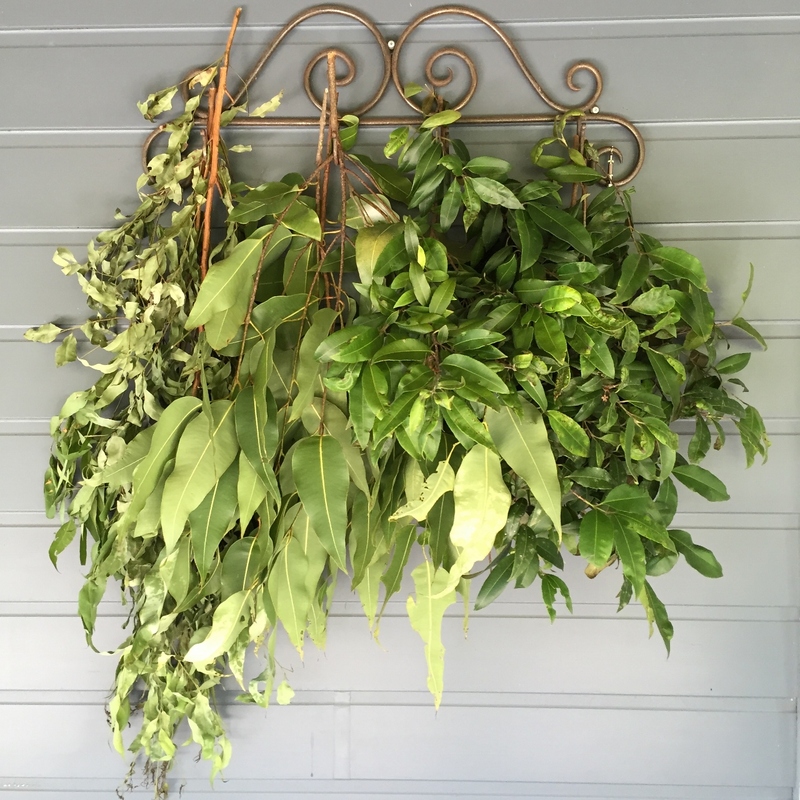 The rack by the back door where I used to hang my sunhats and gardening accessories is now loaded with eucalyptus leaves (and the occasional hitch hiker) waiting for a dyeing experiment. Stick insect – coming or going? 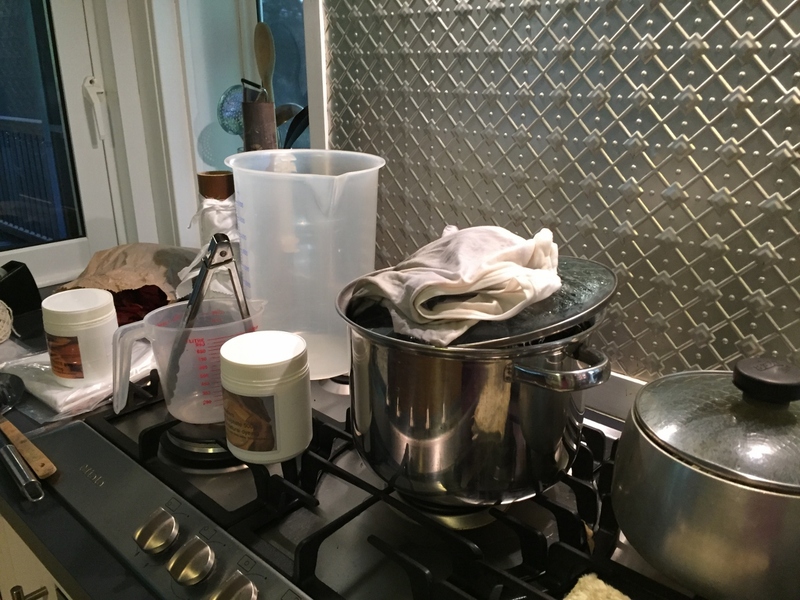 I’ve yet to organise a gas bottle for my barbeque so that I can simmer my cauldrons outside, hence my dyeing experiments are still taking place in my kitchen. Which makes it look somewhat like an amateurish meth lab (not that I’d know what one looked like!). I’m forever stopping and staring at trees, trying to work out if the leaves hold any dyeing potential. 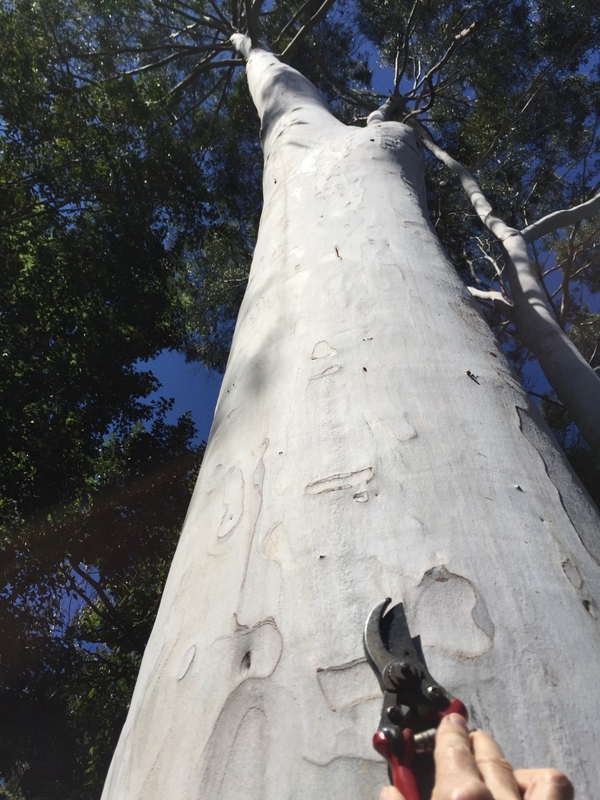 I’m keen to try some Eucalyptus citriodora leaves from a tree in my garden, but it poses a bit of a problem, as the lowest leaves are ever so slightly out of reach. I’ll just have to wait for a storm to send a branch crashing to the ground. In the meantime I’ve been having fun with Lemon Myrtle leaves, and various unidentified eucalypts. One experiment produced a colour akin to radioactive urine (not that I’d know what that looks like either!). I was tempted to call it a disaster and throw it out, but the results on bamboo fabric and an op shop men’s singlet were really rather wonderful shades of soft smoky lemon. Anyway, I need my kitchen back and I’m way behind on garden jobs, so today I dismantle the meth lab for a couple of weeks. Watch this space for more alchemy. Have I ever mentioned that when I see there is a ‘Bellingen Dairy’ email, it always takes priority. I love reading your blog, always interesting with great photos. Looking forward to seeing you on Saturday ! Thanks Des and I’m happy to experiment on one of your t-shirts – all care taken and no responsibility for an unexpected outcome !! Thanks Kala – and I’ve entered a Radioactive Urine Dress in the local show just for fun.